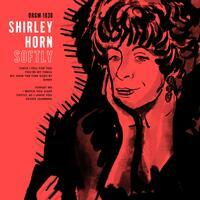 Never before been pressed to vinyl, Shirley Horn's Softly is reflective of the album's late night recording sessions at Peirre Sprey's home recording studio in rural Maryland, aptly named Mapleshade Studio. The 1988 release is commonly referred to as one of Horn's most introspective and emotionally intensive records to date. With her sidemen Charles Ables (bass) and Steve Williams (percussion) gathered into a quaint, pastoral living room full of recording equipment, the trio plowed through the tunes, tracking almost until dawn.